Objectives To assess the occurrence of glaucoma, eyelid, corneal and macular disorders in a cohort of patients with obstructive sleep apnoea (OSA) diagnosed by overnight polysomnography and to investigate into the risk factors for the above eye diseases (EDs). Design Cross-sectional cohort study between 2014 and 2015. Setting Unit of Respiratory Medicine and Eye Clinic of the University of Verona. Participants 431 consecutive patients were considered eligible. Of these, 87 declined to participate, 35 were untraceable and 13 were deceased. Interventions A complete ophthalmic evaluation of both eyes for each patient. Primary and secondary outcome measures Best-corrected distance visual acuity, intraocular pressure, corneal, macular and optic nerve optical coherence tomography, ocular aberrometry, optic nerve laser polarimetry, visual field test, and eyelid examination. Results 296 patients aged 64.5±12.8 years, 23% female and 77% male, underwent ophthalmic examination. There was 56% (n=166) prevalence of eyelid disorders, 27% (n=80) of corneal disorders, 13% (n=39) of macular disorders and 11% (n=33) of glaucoma. Advancing age was not associated with the severity of OSA, while significant differences were found for gender, body mass index, Oxygen Desaturation Index, smoking habit, hypertension and diabetes. Severe OSA was significantly associated with glaucoma (OR, 95% CI 1.05 to 5.93, p=0.037). Conclusions EDs were more prevalent in our patinets with OSA than in the general population. Severe Apnoea/Hypopnoea Index level seemed to play a role as risk factor only for glaucoma. This is a cross-sectional cohort study that provides prevalence and risk factors of eye disease in patients diagnosed with obstructive sleep apnoea using overnight polysomnography. Each patient had a complete ophthalmic evaluation of both eyes. The study was carried out in a university setting, and it was possible that our patients were a subgroup of obstructive sleep apnoea population. The diagnosis of OSA requires the combined assessment of relevant clinical features and the objective demonstration of abnormal breathing during sleep. Current evidence supports the view that clinical assessment alone does not suffice to make a diagnosis, nor does it provide an objective staging of clinically significant OSA. Currently overnight polysomnography (PSG) is the gold standard for the diagnosis. There is an emerging interest in the epidemiological and clinical evidence for an association between OSA and EDs. However, due to its implication in diagnostic and therapeutic management, it remains unclear whether there are common pathophysiological links and/or the same risk factors and/or whether they are accidentally associated. Studies that investigated into the possibility of there being underlying mechanisms have several limitations due to selection or observer bias, misclassification of patients, sample size or poor statistics. Some of the main weaknesses are due to methodological considerations as to the diagnostic criteria for OSA and EDs, or from studies that only estimated OSA by questionnaire, rather than following instrumental diagnostic procedures. Furthermore, no studies correlate the severity of OSA with the occurrence of EDs. Therefore, the SLEep apnoea and Eye Pathologies studY (SLE.E.P.Y) was set up to estimate the prevalence and risk of eyelid disorders, corneal disorders, glaucoma, macular and optic nerve disorders in patients diagnosed with OSA by PSG. SLE.E.P.Y was a cross-sectional cohort study of adult patients diagnosed with OSA assessed for EDs (eyelid disorders, corneal disorders, glaucoma, macular and optic nerve disorders) at the University Eye Clinic between 2014 and 2015. All patients were previously diagnosed with OSA at the sleep clinic of the same university following overnight PSG because of breathing disorders during sleep and/or suspected OSA. Any patients suspected of having sleep disorders other than OSA (central sleep apnoea, complex or mixed sleep apnoea, and patients with craniofacial deformations) were excluded. The study was carried out in agreement with the tenets of the Declaration of Helsinki. Patients’ written informed consent was obtained. Our Institutional Review Board/ethics committee approved the study. All patients underwent PSG, which lasted a minimum of 6 hours. It was started at 23:00 and a portable device (Embletta-PSD Somnologica, Sapio Life, Reykjavik, Iceland) was used to record nose and mouth airflow, chest and abdominal movement, body position, heart rate, Oxygen Desaturation Index and snoring time. Prior determination of whether the patients were appropriate candidates for unattended portable monitoring was performed by an experienced clinician, according to the American Academy of Sleep Medicine Portable Monitoring Task Force.11 Polysomnograms were analysed and Apnoea/Hypopnoea Index (AHI) was calculated as the number of obstructive apnoea episodes (complete cessation of airflow for at least 10 s) and of hypopnoea episodes (an airflow reduction of >50% for at least 10 s with a decrease in oxygen saturation of >3%) despite ongoing inspiratory efforts per hour of sleep.12 An AHI of ≥5 events/hour was considered suggestive of OSA, defined as mild (5–14), moderate (15–30) or severe (>30). A complete ophthalmic evaluation was carried out for each patient, including best-corrected distance visual acuity (BCDVA) based on the logMAR chart, and slit lamp biomicroscopy of the anterior and posterior segment, including intraocular pressure (IOP) using a Goldmann applanation tonometer after topical administration of oxybuprocaine at 0.4% and fluorescein at 2% with the patient in a sitting position. Corneal examination included an assessment of apical keratometry, vertical symmetry index and surface asymmetry index using corneal topography (Eye Top, CSO, Florence, Italy), assessment of minimal pachymetry and posterior elevation (PE1 and PE2) using corneal optical coherence tomography (Visante Omni, Carl Zeiss, Oberkochen, Germany), and assessment of coma and root mean square using ocular aberrometry (KR-1W, Topcon, Tokyo, Japan). An optic nerve laser polarimetry (Gdx VCC, Carl Zeiss Meditec, Dublin, California, USA) was used to record the nerve fibre indicator (NFI). The average thickness of the retinal nerve fibre layer (RNFL) of the four quadrants (superior, nasal, inferior and temporal) was evaluated by optical coherence tomography (Spectralis SD-OCT, Heidelberg Engineering, Heidelberg, Germany). Mean deviation and pattern SD were calculated by the 30–2 SITA-Standard Humphrey Visual Field (VF) test (Carl Zeiss Meditec). The VF test was repeated if significant fixation losses and/or false positives or negatives were >15%. Macular thickness and volume were recorded using optical coherence tomography (Spectralis SD-OCT). Eyelid examination was performed by evaluating horizontal distraction from the ocular globe of the upper and lower eyelids, and the easy eversion sign of upper eyelid (easy distortion and eversion with minimal superolateral traction). The presence of abnormal corneal thickness and abnormal anterior or posterior ectasia, without corneal inflammatory signs, was considered indicative of a corneal ectatic disorder according to the Global Delphi Panel of Keratoconus and Ectatic Diseases.13 The criteria used to define glaucoma were alteration of VF (paracentral scotoma, nasal step or altitudinal defects) in absence of neurological lesion to explain the VF defect and/or glaucomatous cupping within the optic disc accompanied by an NFI of >50 and/or defects in the RNFL thickness according to criteria for early diagnosis.14 The criteria used to define macular disorders were non-physiological macular profile, a central subfield retinal thickness of >315 µm and a total macular volume of >3.19 mm.1 ,15 16 Diagnosis of any anterior NAION was made following the clinical examination of fundus oculi, and the measurement of both the VF and of the BCDVA. Clinical and instrumental exams were performed by experienced ophthalmologists and a blind assessment of the results was carried out by two ophthalmologists who were not directly involved in patients’ examination. A diagnosis of ED was confirmed only when the two ophthalmologists were in agreement. 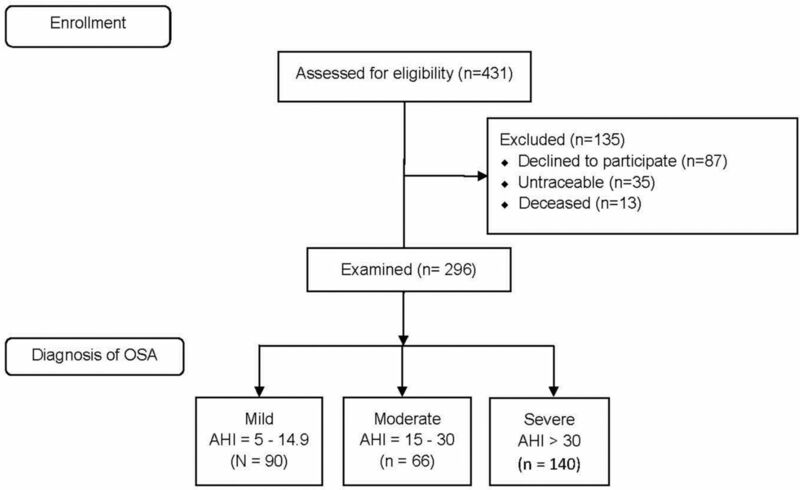 Results for categorical variables were expressed as counts and percentages, and the χ2test was used to assess any difference in demographics and clinical characteristics in terms of AHI levels (mild, moderate and severe OSA) in the study group. The individual prevalence of ED was evaluated, and the CI calculated through normal approximation interval. Each patient was considered prevalent in case of at least one eye being affected. The risk factors of ED were calculated by logistic regression analyses. The independent variables were gender, age, body mass index (BMI), AHI, smoking status and any comorbidities. Multivariable model was adjusted for gender, age, BMI and hypertension as possible confounders, introduced in the model as categorical variables. We performed logistic analyses pondering for patient eyes, and multivariable logistical regression with clustering was used to calculate the adjusted OR for each of the four study outcomes (eyelid disorders, corneal disorders, glaucoma, macular and optic nerve disorders). The p value was set at 0.05 and the CIs calculated at 95%. The Stata V.13 statistical software was used to analyse the data. A total of 431 consecutive patients diagnosed with OSA were considered eligible for the study. Two hundred and ninety-six (69%) underwent ophthalmic examination (figure 1). Participants did not differ significantly from non-participants. The main reason for exclusion was refusing to participate. The majority of the patients refused due to deambulation difficulties and/or need of parents’ assistance. The majority of examined patients were male (77%), with mean (SD) and median age of 62.2 (14.0) and 65.6 years, respectively. Table 1 shows patients’ baseline characteristics according to the levels of AHI. A total of 233 (79%) patients had least one main ED and 50 (21%) of them were under continuous positive airway pressure treatment. Of the 296 patients, 32 (11%) had both eyelid and corneal disorders, 7 (2%) all EDs except NAION, and 3 (1%) were affected by NAION. The prevalence of ED is reported in table 2. Patients with KC had BCDVA of 1.0 logMAR and 25/33 (75.8%) patients with glaucoma had been newly diagnosed. No optic disc oedema was observed. Table 3 shows the frequency of AHI level for EDs. The multivariable analysis demonstrated that a severe AHI level was associated to glaucoma. Flow diagram of the progress of all participants through the study. AHI, Apnoea/Hypopnoea Index; OSA, obstructive sleep apnoea. The second most frequent ED was corneal disorders. The six patients diagnosed with KC accounted for a prevalence of 2%, in agreement with Mojon et al.7 This was a higher value compared with the 0.054% prevalence in the general population.25 Ectasia was also evaluated as a sign of early stage of subclinical KC.13 The results from our study showed for the first time that ectasia was associated with BMI, as expected, and also with the severity of OSA. It is most likely that the aetiological mechanisms for this association are multifactorial. It has been suggested that MMPs and proteinase inhibitors may be causative factors for developing KC in healthy subject, as they lead to a reduction in corneal resistance and corneal hysteresis.26 In patients with OSA, the high serum levels and activity of MMPs or C reactive protein may well account for altered airway biomechanics, leading to repetitive collapse of the upper airway.20 27 The recurrence of hypoxic conditions may lead to anaerobic glycolysis and stromal acidosis, and may promote the transcription of proinflammatory cytokines, tumour necrosis factor-α or interleukin-6, leading to corneal thinning.28 29 Indeed, the systemic low-grade chronic inflammation that affects obese patients may contribute to the development of corneal ectasia. Our study failed to confirm the hypoxic condition as cause of low-grade chronic inflammation since we did not observe a higher prevalence in patients with higher AHI levels. In conclusion, our data showed that only glaucoma was significantly associated with severe AHI. Therefore, we are of the opinion that any previous diagnosis or suspicion of OSA should be thoroughly assessed by an ophthalmologist during ophthalmic examination, due to the implications in the management of increased eyelid laxity and FES, corneal refraction, macular degeneration or, above all, glaucoma. Hopefully this report will prompt further research on the underlying mechanisms involved in the association between EDs and OSA. The authors thank Barbara Wade for her linguistic advice. Sleep-related breathing disorders in adults: recommendations for syndrome definition and measurement techniques in clinical research. The Report of an American Academy of Sleep Medicine Task Force. Sleep 1999;22:667–89.
. Eyelid hyperlaxity and obstructive sleep apnea (O.S.A.) syndrome. Eur J Ophthalmol 1997;7:211–5.
. Clinical guidelines for the use of unattended portable monitors in the diagnosis of obstructive sleep apnea in adult patients. Portable Monitoring Task Force of the American Academy of Sleep Medicine. J Clin Sleep Med 2007;3:737–47.
. New trends in glaucoma risk, diagnosis & management. Indian J Med Res 2013;137:659–68.
. Increased serum levels of C-reactive protein and matrix metalloproteinase-9 in obstructive sleep apnea syndrome. Chin Med J 2007;120:1482–6.
. Corneal hypoxia and hypercapnia during contact lens wear. Optom Vis Sci 1990;67:512–21. Contributors Study design: EP, ADG, CLD, GM, MF. Research conduction: CLD, EP. Data collection: CLD, EB, FB, PPDS, MP. Data analysis: AF, NG. Manuscript writing: EP, CLD, AF. Manuscript approval: MF, GM. Disclaimer The Corresponding Author affirms that the manuscript is an honest, accurate and transparent account of the study reported; that no important aspects of the study have been omitted; and that any discrepancies from the study as planned (and, if relevant, registered) have been explained.